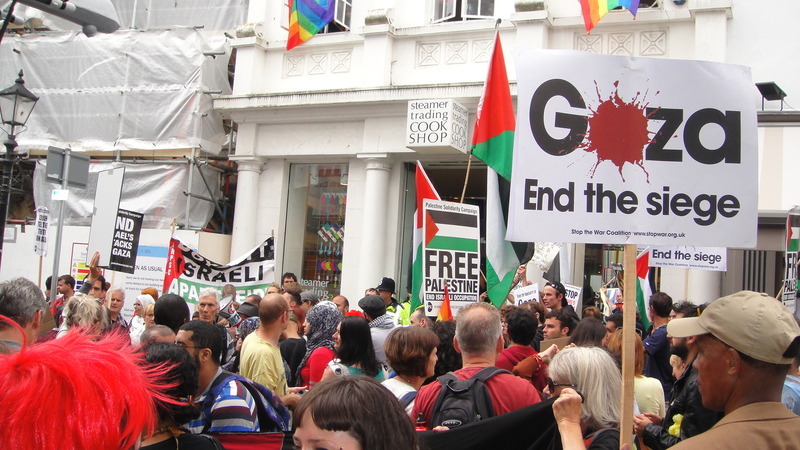 For the fourth weekend running, the people of Brighton & Hove took to the streets in their hundreds to express their outrage over the continuing atrocities in Gaza, and to stand in solidarity with the people of Palestine. 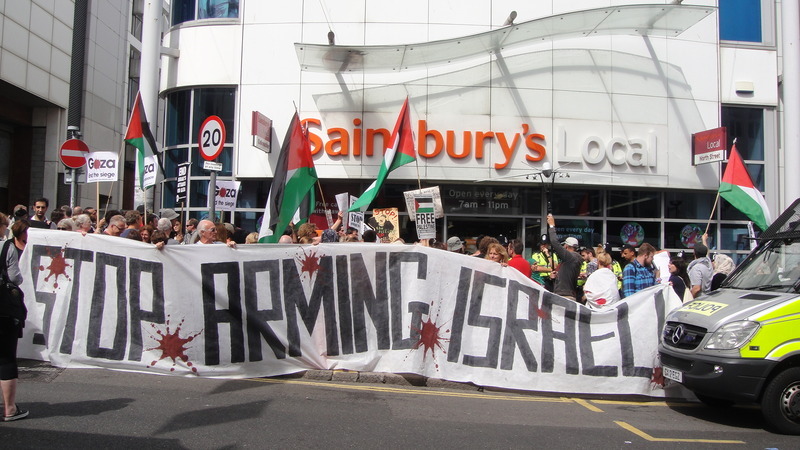 On this occasion, we took the campaign to three important targets in the town – three companies that are complicit in the war crimes being perpetrated by the israeli state against the Palestinian people: Barclays Bank, SodaStream and Sainsbury’s. 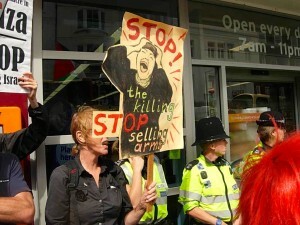 After a brief rally at the Clock Tower, we visited the main branch of Barclays Bank in North Street. 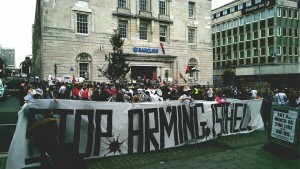 Barclays is one of the largest investors in Elbit Systems – an israeli weapons manufacturer responsible for making the drones currently commiting war crimes in Gaza. Elbit is also currently designing the next generation of killer drones for the UK military (more information here). 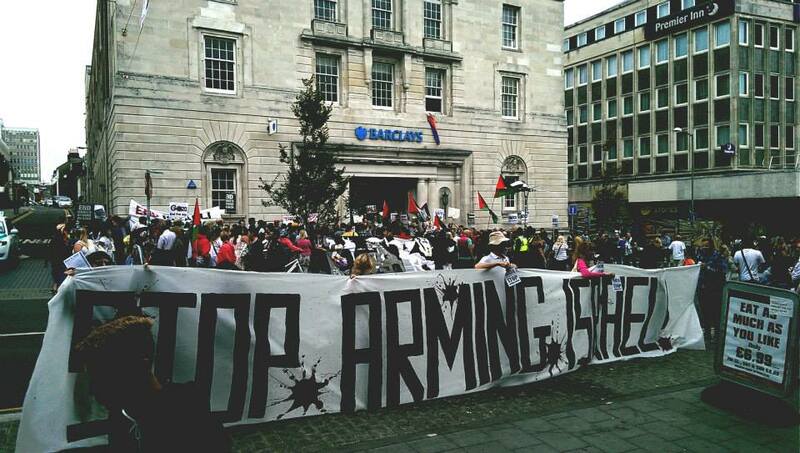 At Barclays we handed out hundreds of “Stop Arming Israel” leaflets explaining the complicity of Barclays in the drone industry, and we staged a mock “die-in” inside the bank to illustrate the role of Barclays in the current carnage in Gaza. This resulted in a brief closure of the bank. From there we moved to Steamer Trading – a local cook shop that continues to stock SodaStream products. SodaStream is of course the parent company of the Ecostream shop that was the focus of a two-year campaign in Brighton. You can read more about that campaign elsewhere on this website. Having closed the Ecostream shop in late June 2014, we are now moving to the other stockists in town: Steamer Trading, Robert Dyas, Lakeland, Argos and ASDA. 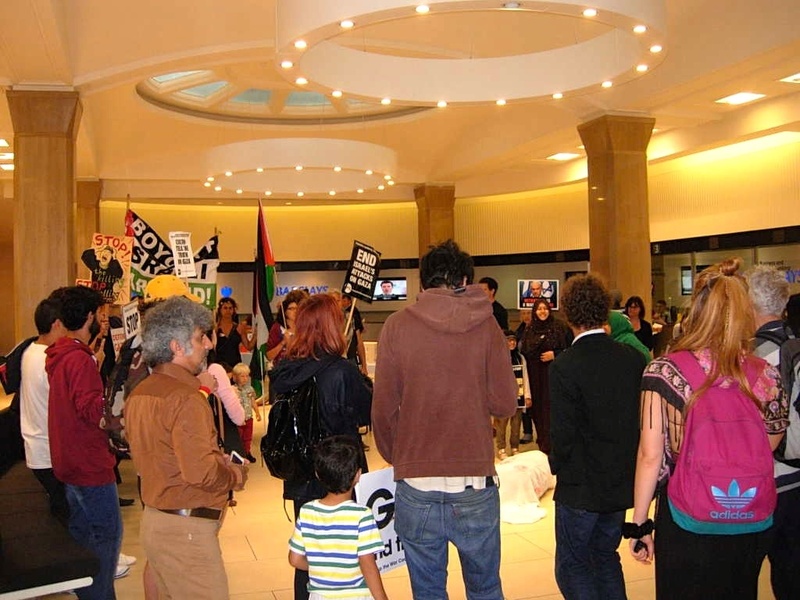 Our aim is to make Brighton & Hove a SodaStream-free city, which would send an important message to israel and the wider international community that the British public want no part in profiting from ethnic cleansing and human rights abuses in Palestine. 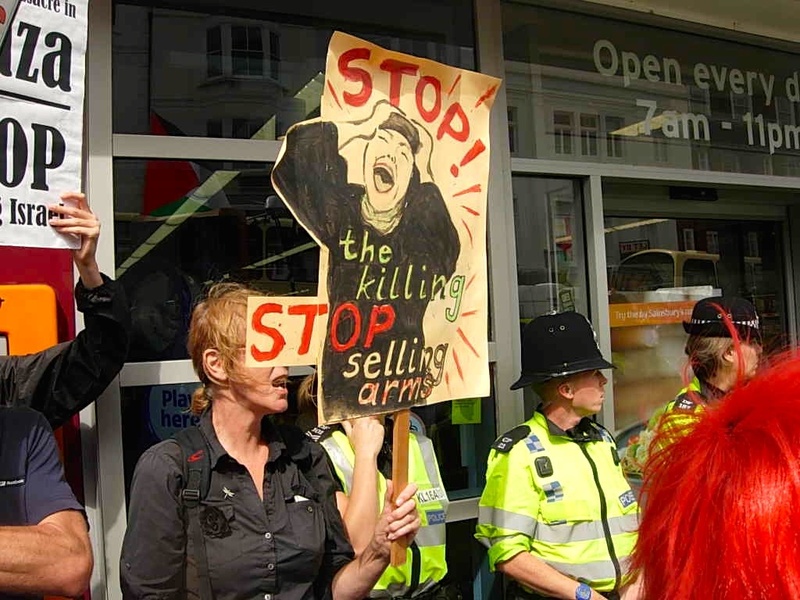 And finally we demonstrated outside the Sainsbury’s Local in North Street, as part of a monthly national Day of Action against Sainsbury’s (more on the Sainsbury’s campaign here). Despite its excellent ethical trading policy, Sainsbury’s continues to do business with the illegal israeli settlements in occupied Palestine. We handed out hundreds of “Taste the Indifference” postcards and briefly closed the supermarket. 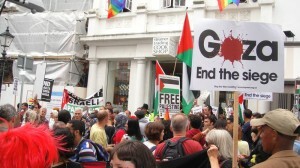 All these actions contribute in small but significant ways to the vital political message of our campaign: Boycott, Divestment and Sanctions against israel until it complies with international law and agrees to creating the conditions in which the Palestinian people can decide their own future. Please check our website, Facebook page and Twitter feeds for information about future activities. 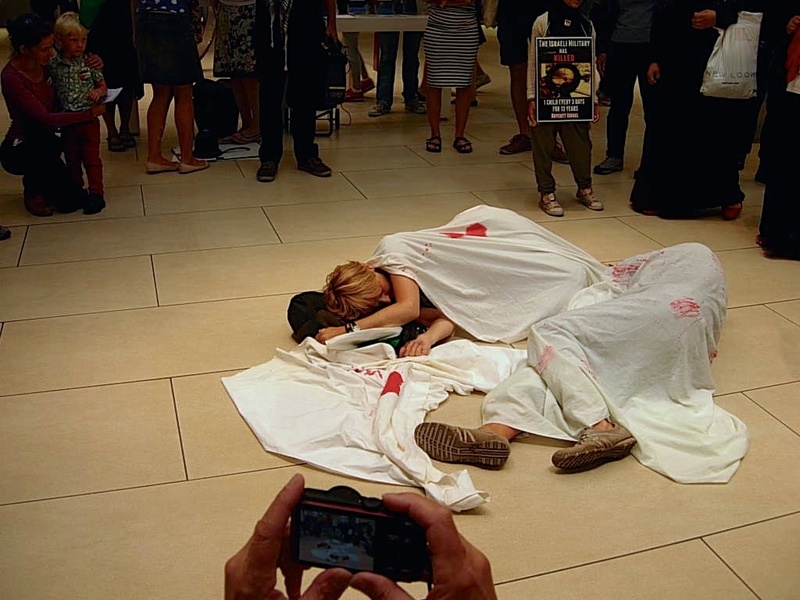 Israel’s collective punishment of the people of Gaza shows no immediate sign of abating, so we will keep up a strong presence in the town to raise awareness and to show our sympathy and support for Gaza.